Read our warranty and you’ll see how strong it is… but, we guarantee you won’t even need it because our products are manufactured with the highest quality materials and the utmost care! Vinyl Patiokits.com fabricates pergolas with quality materials and state-of-the-art manufacturing processes to provide you with years of low maintenance service. 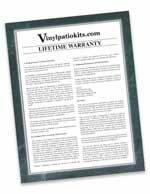 VinylPatioKits.com (hereinafter referred to as VPK) proudly warrants to the original homeowner/consumer that its vinyl pergolas are free from defects in material and manufacturing workmanship. That includes peeling, rot, splitting, blistering, rusting, flaking and corroding when subject to normal and proper use. Should any such defect of degradation (as described above) be discovered, and as long as the original homeowner/consumer is still living and has ownership of said property, we will replace or refund the purchase price of the defective material (including reasonable vinyl material quantities necessary to remedy the covered defect) except where damage is caused by improper installation or conditions as detailed in section B, C and D.
VPK shall not be liable or responsible for labor expense or other expenses pertaining to the removal, replacement, or installation of either the original or replacement material. Any cost and expense beyond VPK’s liability as described in this warranty agreement shall be the homeowners/consumers responsibility. The lifetime coverage stated by this warranty will automatically end upon the sale of the property or death of the last of the original homeowners/purchasers of said property. The lifetime warranty is intended to cover individual homeowners/consumers residence only. This warranty covers defects in material and/or manufacturing. It does not cover failure of or damage to such products resulting from faulty or improper installation; settlement or failure of any structure on which the product(s) is installed; settlement or soil movement; misuse; impact of foreign objects; painted, varnished or coated vinyl; intentional or negligent acts of damage; fire, wind, flood, hail, lightning, or other acts of God; improper care or failure to provide reasonable and necessary repair of the product, normal* and expected weathering of the surface; chalking, mildew; exposure to harmful chemicals or metal oxides, vapor or acid rain and surface discoloration due to atmospheric pollution. *Normal weathering is defined as exposure to sunlight and extremes of weather and conditions, which may cause colored surfaces to gradually fade, chalk, or accumulate dirt and stains. If you feel that your VPK pergola is not free from manufacturing defects or degradation as described in section A, you must notify VPK in writing within ten (10) days following the discovery of the damage or alleged defects. Briefly state the nature of your complaint and submit 1) Proof of purchase with date 2) Pictures of defect 3) Samples 4) Proof of property ownership 5) Copy of contract if installed by contractor. VPK must have reasonable opportunity to inspect the product before material replacement is provided. If the patio kit is deemed to be defective by VPK, then VPK will replace or refund at our option, the defective part or portion in accordance with the terms and conditions contained in section A, B, and C.
VPK reserves the right to discontinue or modify its products without notice. Furthermore, VPK shall not be held liable for changes to its products or its offerings, nor shall VPK be liable for difference in color or gloss of replacement material in comparison to the original product according to the standards established for weathering. In the event a claim is made for discontinued or modified product, VPK will, at its option, supply vinyl material of equivalent quality and value or refund the purchase price of the warranted product(s). In the event of repair or replacement under terms of this warranty, the original warranty shall apply to the replaced VPK patio kit and will extend at the time the material proved defective. This warranty replaces all other oral or written warranties, liabilities or obligation of VPK. VPK makes no express warranties except as herein stated of consequential damages with respect to its products and accessories covered by this warranty, the extent of its liability and the owner’s exclusive remedy being limited to repair or refund at VPK’s option, as set forth herein. Some states do not allow limitations on or the exclusion of incidental or consequential damages, so the above exclusions may not apply.